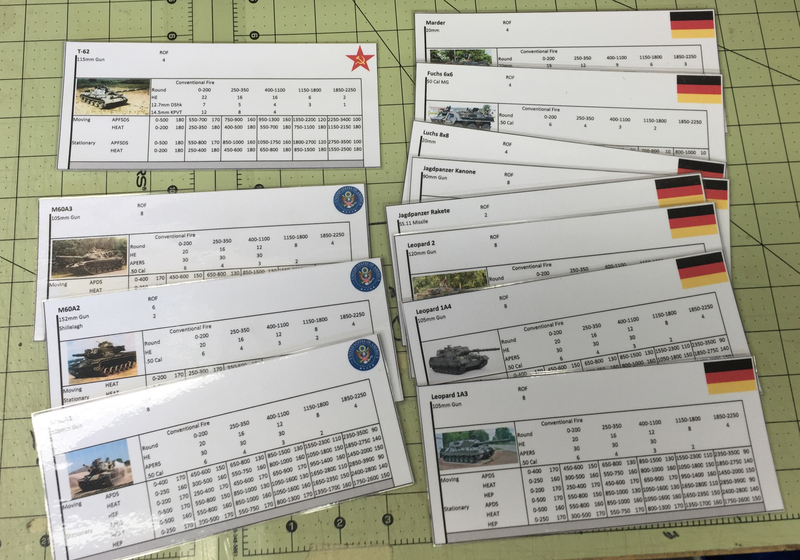 Tonight I added the first of the vehicle data cards for Germany. More to follow. TAC II is a project that I have been working on since the 1980’s when GHQ/GDW released TACFORCE. TACFORCE was modern wargaming rules for use with Micro Armor. When I say“modern,” I mean modern as of 1980 when it was published. At the time TACFORCE was printed, the most state of the art vehicle card in the data card deck was the M-60A3 Main Battle Tank. There was also something called the “XM-1” but that was still just a theoretical experimental vehicle. Sadly, TACFORCE was abandoned after its initial publication. I think it sold well but for some reason, GDW/GHQ did not see it as a product worth keeping. Obviously, I disagreed with that position. From the time TACFORCE was published, I have been updating the data to keep up with new vehicles and weapons. I named my project TAC II, short for TACFORCE Version 2. One of the many changes I have made is to convert all distances from inches to meters, this way, these rules and the data cards can now be used to play in any scale you like. This book covers the rules for playing the game. The necessary vehicle data cards can be downloaded for free from this site. Everything you need to play TAC II (rules, data cards,charts, etc) is available for free on this website. This is not a commercial venture for me. I am not profiting from this. It is a labor of love. 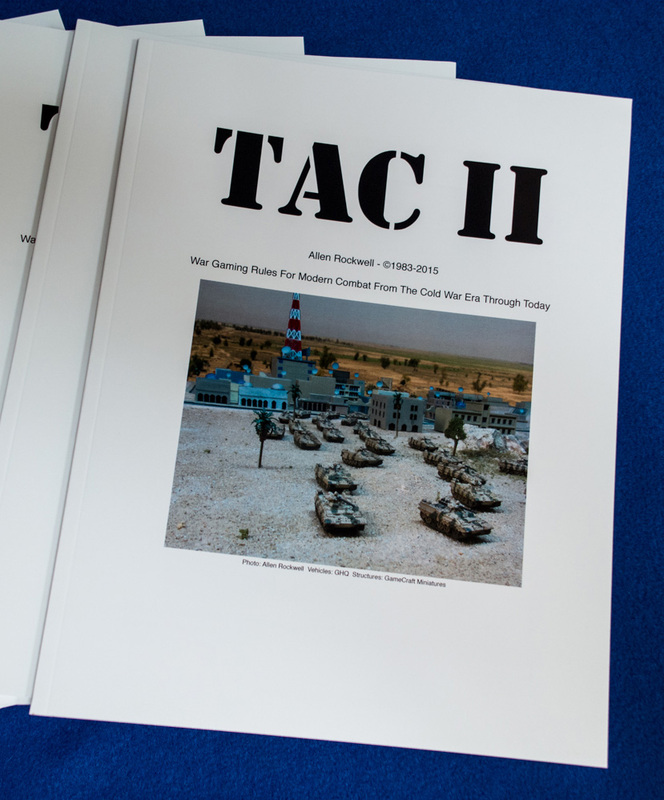 The TAC II Rule book (this book) is available for free in PDF format by clicking here. This professionally printed and bound version is being provided for people that would rather have a physical copy instead of (or in addition to) the free PDF file. This book is being provided to you at my cost (printing, tax and shipping). I am not making any profit from the sale of this book. It is being provided as a courtesy to those that want it. I highly recommend that you download the free PDF version of this book, have a good look at it and then decide you want a printed and bound copy. Then come back and purchase this book if you like. The book is 8 1/2” x 11“, 68 pages and is printed in color on high-quality paper, and the covers are very heavy weight glossy stock. Most important disclaimer: The TAC II Rule Book is, and always will be, a work in progress. This is version 2.0.7 and is the result of many hundreds of hours of work over the years and is the rule book that I use to play my Micro Armor battles.However, I do not guarantee that it is without errors or omissions. Again, download the free PDF version, have a good look at it and then decide if you want to purchase this bound version. If you would like a printed copy of this book, click here to buy it. Version 2.0.7 of the TAC II Rule Book is now online. There are no major changes, just a lot of small changed as a result of continued proofreading. On the “Data Sheets and Rules” page you will notice that TAC II Rules Book version 2.06 is now online. This latest version includes many corrections to Parts 1-3 due to a lot of proofreading on flights to and from GenCon last week (still more to do, I’m sure). The major change to this version is the addition of Part 4 to the rules, which before now was “Book 2”, a separate volume. Now all the basic rules are in parts 1-3 and the advanced/optional rules are in part 4. A quick tutorial showing how the Vehicle Cards are used to resolve combat. It’s not rocket science, but you might pick up a tip or two from someone that’s put a lot of these together.